Here you have the best 4 room tents for camping currently available on the market. All of them are very large cabin or tunnel type tents suitable for groups, couples, and for families with kids. The tents with the capacity determined by backpacking principle. The tents where this principle is not used. In the first group you will see tents with a huge declared capacity, so they can indeed accommodate such numbers of users, but for real camping this is not realistic. As I argued in my text about the tents’ capacity, it is best to divide such numbers by two. The other group includes tents with a generous space per person, you will see some of them with 3 meters per person or so. I guess the meaning should be obvious. The cabin tents are usually very tall and with straightened walls, great windows etc. These are mainly summer camping tents. The tunnel tents are mostly from the European brands and with a huge waterproof rating. So these are tents for all weather conditions in a 3-season use. 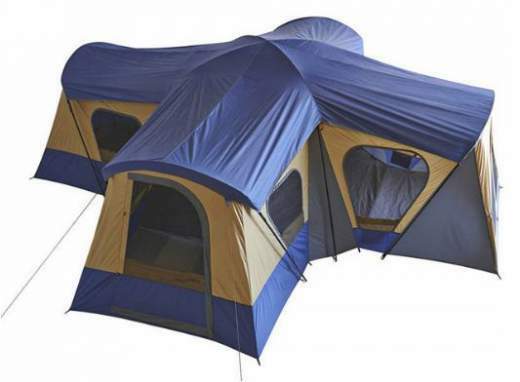 This Carson 14 tent has three floored rooms plus a front screen room. So the screen room is not floored and it is without panels on the sides, but it is so large and with fly above, that the bigger part of it is protected from the rain, and this is why I have added it to this list with 4-room tents. The tent is high in the list because of “only” 182 ft² (17 m²) of the floored area, but the total area is 276 ft² (25.8 m²). So you have two side square rooms and one central pentagonal-shaped room and they are with real walls in between and connected with huge doors. But they also have huge doors to the screen room. There are also 6 huge windows with mesh and zippered panels, so the whole structure is very pleasant and nicely organized. Note that this is a very tall tents with 94 inches (239 cm) peak height. The Marna 600 XL has “only” 192 ft² (17.8 m²) of the inner floor area, but you also have a huge porch so the total protected area is 267.3 ft² (24.8 m²). Note also that the porch is fully enclosed, though floorless, so it looks like an extra room. The inner area has 3 sleeping units plus a large living room, and this is why this tent is here in the list as a 4-room structure. But I could have added it in the group of 5-room tents as well. 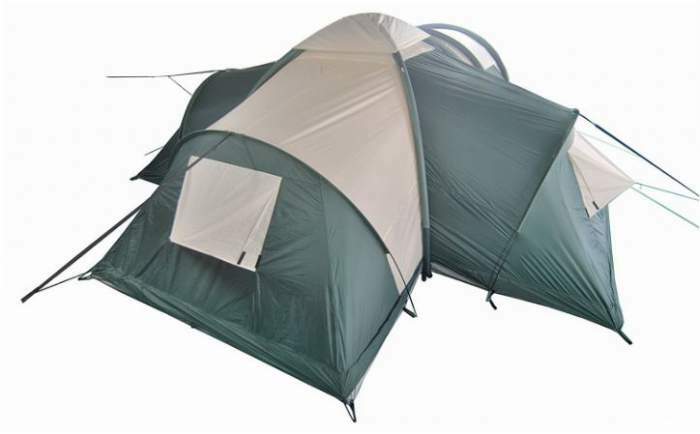 You have 11 PVC windows so the tent is very pleasant and livable. The inner sleeping area is what they call the lights out design. The waterproof rating is as impressive as everything else here, you have 4000 mm for the shell tent and much more for the floor. Please read more in my full review. Eurohike Buckingham 6 Man Tent. This is a tunnel type tent with 3 sleeping rooms, each for two people, plus a living room in the middle. 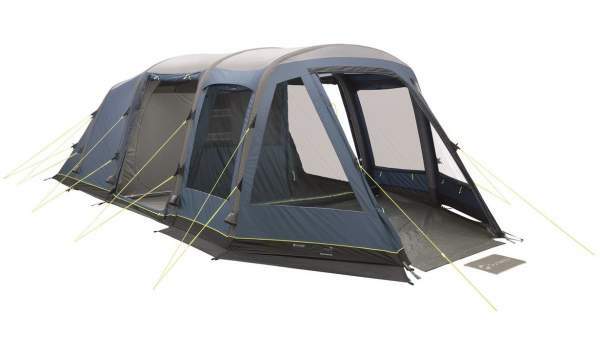 The tent is with 2 doors on the opposite sides, and you can create awnings with their flaps, one is shown in the picture. But you have an option to remove one of the inner tents and then you have an extra door on the front where you can create yet another huge awning. The tent offers 192 ft² (17.85 m²) of the area, which means 32 ft² (3 m²) per person if used by 6 people as they suggest with the declared capacity, so this is a very generous option for family camping. There are plenty of useful features here, like the PVC windows, many storage pockets, various configurations with awnings, and above all a reasonable price. Note that the waterproof rating for the fly is 2000 mm and 3000 mm for the floor. Please read more in my detailed review. As you see from the name of this tent, it is with the official capacity of 14 people. But when you check its floor area you have around 222 ft² (20 m²). Now, this is huge but this means only 15.9 ft² (1.43 m²) per person and this far from enough. So you remember what I said above, divide the official capacity by 2 or so, and this will give you a realistic number for camping. This is an interesting cabin style design in the shape of the cross, with 4 rooms and each of them has its own entry door. So the tent offers lots of privacy and can be used by several couples. Note that you have no less than 12 windows, simply incredible. The tent is for summer camping, with all the features that come with this. So the ceiling is mesh, the fly is only partial. 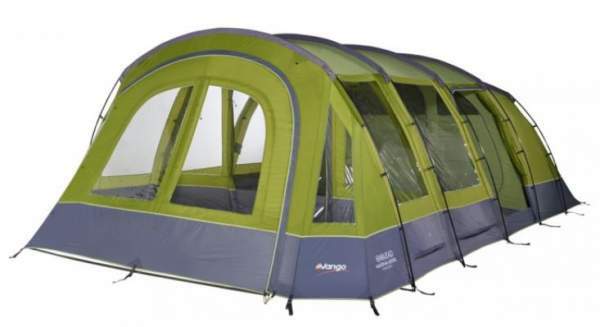 This is a very affordable tent, please follow the link to read more. This tent is here because of its 4 rooms. The space is divided into two inner sleeping rooms, plus a central living room, plus a front room. The difference between the front room and the rest is only that the floor in the front room is removable, linked-in with toggles. In the remaining part, the floor is fully sewn-in and sealed. It also offers no less than 21 m² (226 ft²) yet its declared capacity is only 5 people. So it can accommodate far more people, I would say 8 – 9 easily. 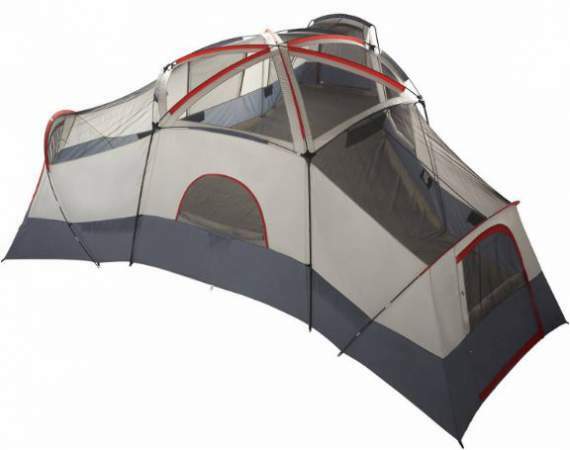 This is also a tent with an air-beam technology, without classic poles. You have tinted PVC windows, three entry doors and all with mesh and panels. Coleman Air Valdes 6XL Tent. This tent offers the area of 230 ft² (21.44 m²) in its 4 rooms, plus 113.7 ft² (10.56 m²) under the porch which you see in the picture. Its official capacity is only 6 people and this means you have 38.4 ft² (3.57 m²) per person in the inner area. Apart from such a huge area, you also have air beams here. The sleeping rooms are with what they call the blackout design, which blocks 99% of the daylight. Related to this is also the climate control, and the meaning of this is that the tent creates a cooler atmosphere during the day. The windows are PVC, the tent is with 3 entry doors, and the waterproof rating is impressive 4500 mm. Yet another nice feature is its hinged door under the porch. Please read more in my full review. Neumayer Inflatable Family Tent XXL Fiji. This is a type which is difficult to put in any of the mentioned groups. The central dome is extended in all directions, and the picture shows the extended sections where the three sleeping rooms are located, while the central area is a living room. The tent is with the declared capacity of 6 people, but you have 22.75 square meters (245 ft²). So this is obviously a very luxurious tent for families and also for 3 couples. It offers 3.8 square meters per person. Note that the walls of the sleeping rooms are sewn-in, and the rooms are physically separated due to the living room in the middle, so this is the best privacy you can have in a tent. The waterproof rating for this tent is impressive, you have 4000 mm, and this should give all the protection you need in a 3-season use. There are 5 vents around so ventilation should be good. Ozark Trail 20 Person Tent. This tent is huge in every sense, by the floor area and by the declared capacity. As you realize it is designed for 20 people, but they have used the backpacking principle. Here is what this means: the floor area is 280 ft² (26 m²), so when you divide by 20 you get only 14 ft² (1.3 m²) per person and this is not so great. But you have 4 rooms and the central living room is huge, so the tent offers plenty of space for up to 10 – 12 people. It has space for up to 6 queen size beds. It is perfect for 3 couples who have privacy in separate rooms and to share the living area with others. Although it is so huge and has no less than 20 poles, you can set it up in 20 minutes. The structure is a cabin type with 8 large windows and 3 doors, a typical summer camping tent for very mild weather conditions. Please see more in my review. This tent is here because of its 4 rooms that provide 290 ft² (27 m²). They include two sleeping rooms, one living room, and one front room with a removable floor. As you realize this is a tunnel type tent, but this is a specific one with air beams instead of classic poles. So the setup is easy with the included pump. The sleeping zone is a tent within the tent and with dark rest features. There are 8 PVC windows and they are all tinted, but you also have inner shutters for privacy. The waterproof rating is impressive just like everything else here. So you have 4000 mm for the shell and 10000 mm for the floor. This is a very reliable tent for a 3-season use. So this was my list of the best 4 room tents for camping, it will grow as new tents appear on the market so bookmark this text and check it from time to time for updates. You might want to subscribe to my email news, there is a signup form below. As you realize, these are all large tents but this is normal in view of 4 rooms they have. This is why you will find most of them also in my list of extra large camping tents. If you need a 3-room tent, please check this long list. How about 5-room tents? See these incredible models. Thank you for reading and please use the comment box below in the case of question or comment. Have a nice day. Plenty of tents to consider and so much information given. When I need a new tent I’ll have to re-read this article. Thank you Les, perhaps you noticed that there are more and more tents from some EU brands appearing on the US market now. They are with huge waterproof rating and usually wiyh many rooms. You have some great examples here.